Current planet formation models (e.g., Lissauer 1987) suggest that dynamical interactions within developing planetary systems may cause planets to be injected into the interstellar medium. Although isolated planets might be expected to become frigid, inhospitable environments, Stevenson 1999 argued that a free-floating planet could support a liquid ocean on its surface if the planet built up a substantial H2 atmosphere that trapped the internal heat of the planet. While the Earth receives the bulk of its energy from the Sun, the Earth also produces heat internally from the decay of radioactive elements (primarily U, K, and Th) in the Earth’s crust and is still radiating heat from its initial formation through gravitational collapse. In this paper, Abbot & Switzer consider the habitability of a free-floating Earth-like planet with mass and water content within an order of magnitude of that of the Earth and roughly the same composition of radioactive elements. As shown in the Figure, they find that a 3.5 MEarth planet with the same water content as the Earth could support a subglacial liquid ocean under a frozen water ice shell and a frozen CO2 cryo-atmosphere. They also report that even a 1.3 MEarth planet could support a subglacial ocean if it had ten times the water content of the Earth. The source and abundance of the Earth’s water is still an open question in planetary science, so considering planets with a wide range of water contents is a logical step. Required water mass fraction for a free-floating planet to support a subglacial ocean as a function of the planetary mass (plotted along the x-axis) and the temperature of the surface of the ice shell (plotted along the y-axis). 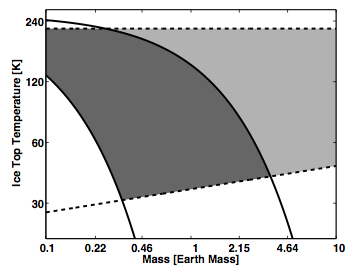 The light gray region indicates the regions of parameter space for which a planet with Earth's water mass fraction could support a liquid subglacial ocean. A liquid subglacial ocean is possible in both the light gray and dark gray regions of parameter space if the planet has a water mass fraction ten times greater than Earth's. From Abbot & Switzer 2011. Abbot & Switzer model the stability of a liquid subglacial ocean by first determining the steady-state thickness of the outer ice shell by assuming that all heat is transported via conduction. In their calculation of the steady-state ice thickness, the authors assume that the geothermal heat flux of a Super Earth increases roughly with the square root of planetary mass. They then determine the effective temperature of the outermost layer of the planet (above the ice shell or cryo-atmosphere) by using the Stefan-Boltzmann Law to balance the geothermal heat flux from the interior of the planet with the planet’s thermal emission. After modeling the conduction-only case, the authors expand their model to incorporate convection. Throughout the paper, the authors refer to free-floating planets with subglacial oceans as “Steppenwolf planets” because, “any life in this strange habitat would be a lone wolf wandering the galactic steppe.” Since the life would likely be confined to the subglacial ocean and the lower levels of the ice shell, would we be able to detect it remotely? Abbot & Switzer state that the far-IR thermal emission from a Steppenwolf planet could be detected out to ~4000 AU by Herschel, but the planet would need to be within 830 AU for the reflected light from the planet to be detected by Pan-STARRS or LSST. While Steppenwolf planets could also be detected via microlensing, those candidates would most likely be too far away for follow up observations. Searching for life underneath the subglacial ocean would be even more challenging than spotting the planet, but perhaps future generations of astronomers will be able to apply the lessons learned from yet-to-be-obtained drill cores of Europa to the characterization of distant subglacial oceans. Are Extrasolar Worlds More Likely to Be Water-rich? 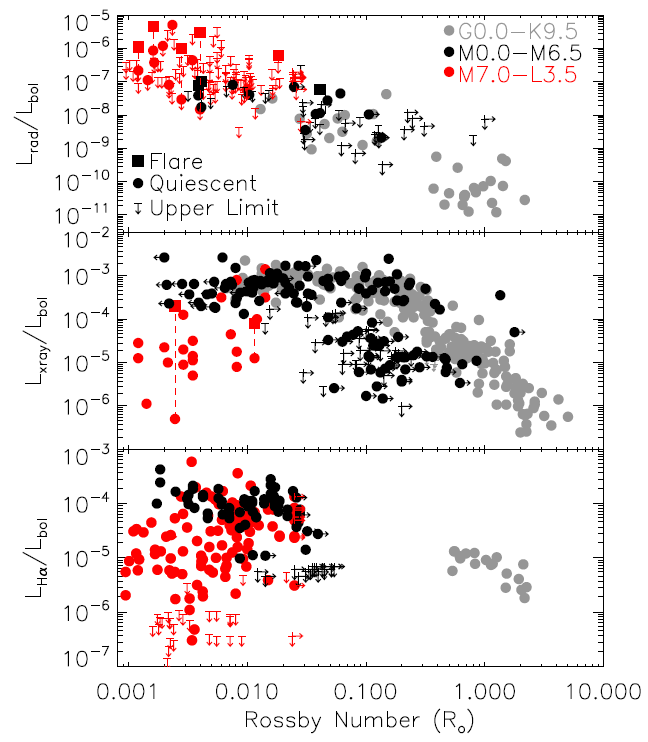 The Radio Activity-Rotation Relation of Ultracool Dwarfs How Hot is Too Hot? Sustainable Climates on Greenhouse Super-Earths? I’m surprised that the surface ice would only be ~10km thick for an Earth-mass planet… But I don’t know why I’m surprised. I guess I’m not. Also, I love this blog! I promise someday to leave a useful comment.